market share), and Mera Capital (a project management company that led over 5 successful IPOs). Risk of insolvency of cargo owner. Final payment for service is usually executed after the moment when the cargo owner accepts an object from the freighter. This forces freighters to run due diligence of cargo owners and charge premium for default risk on their liabilities. Logistic companies vary their fees by 30% and even back down on the deal depending on the reputation of а counterparty. Risk of hidden damage. А freighter may damage а cargo and succeed in hiding it (even without knowing it) from а forwarder or next actor in transportation chain. Should the cargo owner (or the last nexus of supply chain) receives defected goods, sometimes it is not possible for company to demand а compensation in а court, since it does not know who exactly is responsible for а damage. Tax evasion Risk. Should tax regulators suspect at least one party in the supply chain of tax evasion, cargo gets withdrawn or frozen. Currency risk. Freighters and forwarders may set prices in currency which is different from operating currency. ln that case, the logistic company is forced to complement contract with overcharging fees to eliminate risk of currency devaluation. This makes logistic services more expensive. Underinsurance: Most of the forwarding companies practice is to insure only transportation losses, but not compensation of cargo damage. The cost of finding information about the carrier’s tariff and transaction costs are critically high – due to market fragmentation and no standardization for payment schemes, document flow, availability of additional services and taxation. This makes markets less competitive and seller-driven. Thus, а cargo owner challenge is to know in advance and compare the price of transportation and do time-costly due diligence. The problem impacts both cargo owners and freighters. Idle runs that result in an export/import imbalance, for example where a truck driver delivers a beverage from Parma to Cosenza and returns empty because there is no export/shipment from Cosenza. In this scenario, currently a freighter tends to double his fees to cover the risk of imbalance. Business strategy of а multimodal application is based on providing customers with а fundamentally new way of interacting within the logistics market. Cargo transportation is monitored from the request till successful completion of the deal. AII actions are recorded in the blockchain, which omits trust issues between parties. Smart contract, approved at the beginning of shipment, will automatically execute mutual settlement according to data stored in blockchain. Moreover, IMMLA has commercial interest in the successful completion of cargo transportation for all parties. (Unlike the current web portals, where the main revenue is generated from subscriber payment/connection fees, and the service is not responsible for the successful outcome). Online GPS tracking of cargo location, and the status of its damage in the moment with the use of blockchain technology. Tracking data will be aggregated, unified and showed to end user. This will highlight idle equipment and enable data mining, leading to significant decrease in delay rate and overall higher efficiency. Forecasting would help to lower ports load, lengthening planning horizon and reduce bottlenecks. Dutch auction means cheaper transportation – the principles of cost reduction due to competition using. The customer chooses an option of delivery that fits in terms of price, terms and additional services. Relatively low fee for services (l % vs. 8-l 5% for conventional forwarders and l 0-25% for brokers) distinguishes IMMLA from sector competitors. 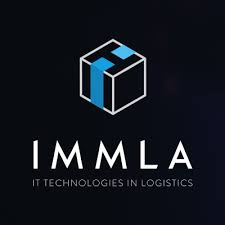 Integration of а full cycle of cargo transportation into the functionality of one application will allow IMMLA to provide а valuable service on the freight market: the business process with the IMMLA application are risk-backed, more profitable and more reliable than the direct interaction of freighters with cargo owners. 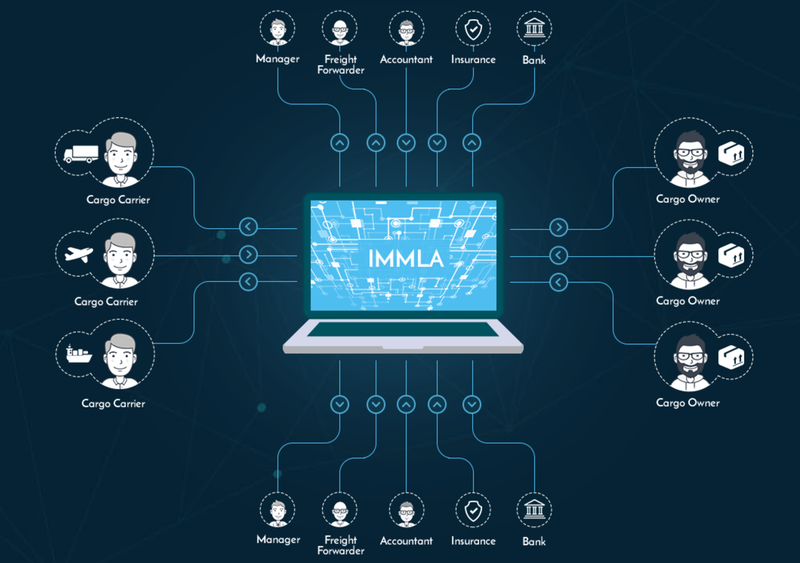 IMMLA investor reward: IMMLA redeems & burns tokens at the expense of 36% of transportation revenue. Tokens of Founders are non-transferable upon ICO completion – locked for 5 months through а smart contract function.